"You must travel with understanding as well as hope." REFUSIAN: Doctor, we are, as you know, concerned about the arrival of the Ark and what it will mean to this planet. DOCTOR: Yes, yes, I can quite understand that. That is why you destroyed the Launcher? REFUSIAN: Here, we've always known peace. Never war or conflict. DODO: You're not the only ones like that. The Guardians, you know the humans who travel in the spaceship, they have used to have your ideas too. DOCTOR: Yes, that's true my dear but, you mustn't think they were perfect. Oh, no. Sometimes they were extremely intolerant and selfish. REFUSIAN: Is that why they were conquered by the Monoids? DODO: Yes, I know. But there are some of them left who wouldn't mind rising up against the Monoids and trying to do better. REFUSIAN: Then we will allow them time to make their attempt. We will wait for the passing of one day before we think in terms of employing defensive measures. The Monoids then are divided and fall on each other wiping most of them out. That then leaves just the bomb on The Ark, which still holds the miniaturised Human & Monoid populations so must be found and destroyed. 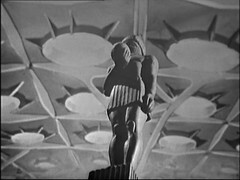 Fortunately the Refusian is willing to help and moves the statue out of the ship. How does he do it? 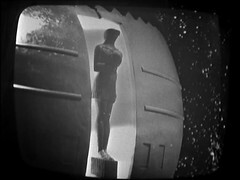 He's small enough to fit into the capsule yet moves that huge statue? Can he change size? Has super strength? Telepathy? DODO: Do you think you'll be able to get everything down onto Refusis now? DASSUK: We'll manage, especially if the Refusians help us. REFUSIAN: We'll do everything we can to assist you in settling on our planet. REFUSIAN: But one thing you must do. REFUSIAN: Make peace with the Monoids. DOCTOR: He's right. 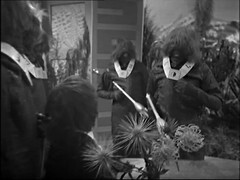 A long time ago, your ancestors accepted responsibility for the welfare of these Monoids. They were treated like slaves. So no wonder when they got the chance, they repaid you in kind. REFUSIAN: Unless you learn to live together, there is no future for you on Refusis. DOCTOR: Yes, you must travel with understanding as well as hope. You know, I once said that to one of your ancestors, a long time ago. However, we must be going. Goodbye. As a whole I'm not wildly enthusiastic about the Ark as a story. There's some nice background ideas being thrown around and I like the idea of returning to the scene of an earlier adventure to examine the consequence. But both are done better later: notably Curse & Monster of Peladon return to the same place 50 years later and we get human populations being shipped to new homes on Spaceships in Invasion of the Dinosaurs, Frontios and, notably, Ark in Space. But my appreciation for the technical aspects knows no grounds. 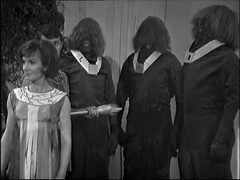 Knowing the limitations of how Doctor Who was made in the sixties this episode is a wonder being recorded out of scene order and then assembled in the editing suite featuring a pitched battle shot on film and several effects shots of the launcher travelling. Seriously, watch this with the production subtitles on, you'll be amazed at what they managed and appreciate the effort even if the story doesn't do it for you. What's more amazing is that Michael Imison was no longer required as a director by the BBC after masterminding this story: his superiors handed him notice terminating his directorial contract as the final episode went before the cameras. Given the technical accomplishments here that's criminal. 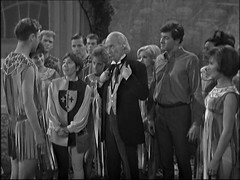 He would go on to script edit the second season of Out of the Unknown later in 1966, 4 examples of which survive to this day and can be seen as part of the Out of the Unknown 7-Disc DVD Set. 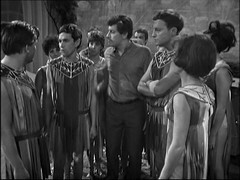 A couple of new Monoid extras are added to the throng this episode: John Caesar has been the 2nd Man in Market in The Romans 1: All Roads Lead to Rome and an Egyptian Warrior in Dalek Masterplan 9: Golden Death. He returns as a Cowboy in all four episodes of The Gunfighters, a guard in all four episodes of the Macra Terror and even gets an onscreen credit in the fourth episode, a Pirate Guard in The Space Pirates episode 1 and a pirate in episodes 4 & 5 of the same story, C.P.O. 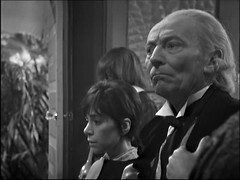 Myers in The Sea Devils episode six and the R/T Soldier in Invasion Of The Dinosaurs part one. Bill Richards was previously a Sailor in The Chase 3: Flight Through Eternity and returns as a Pirate in The Space Pirates episodes 1 & 4, an Alien Guard/Union Recruit in The War Games episode three and an 1862 Union Soldier in The War Games episode four. Paul Erickson's sole further contribution to Doctor Who was to novelise this story for Target books in 1986. It was released on video in 1998 and on DVD on 14th February 2011 just before I first blogged about this story. A few years ago I ran a blog An Episode A Day Keeps The Daleks Away where I watched every episode of Doctor Who in order from the start. 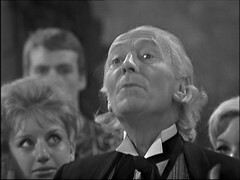 These are those blog entries revisited and revamped for the fiftieth anniversary of their original broadcast.